Steenbergs began life in the late autumn of 2003. Our youngest child had just had her first birthday and wasn't walking on her own. Steenbergs has now been going for around 10 years (our 2 children are nearly taller than Sophie) so we thought it was time to take a trip down memory lane. We've grown from just Axel and Sophie rattling around in an empty starter unit, designed for food start ups, with occasional (very occasional orders) coming in, to 11 Steenbergs staff, most working in production and dispatch. We've moved just once in 10 years, around the corner, into a bigger space but on the same business park. When we first started a pallet of jars lasted us about 6 months, now it can last us 2 days. 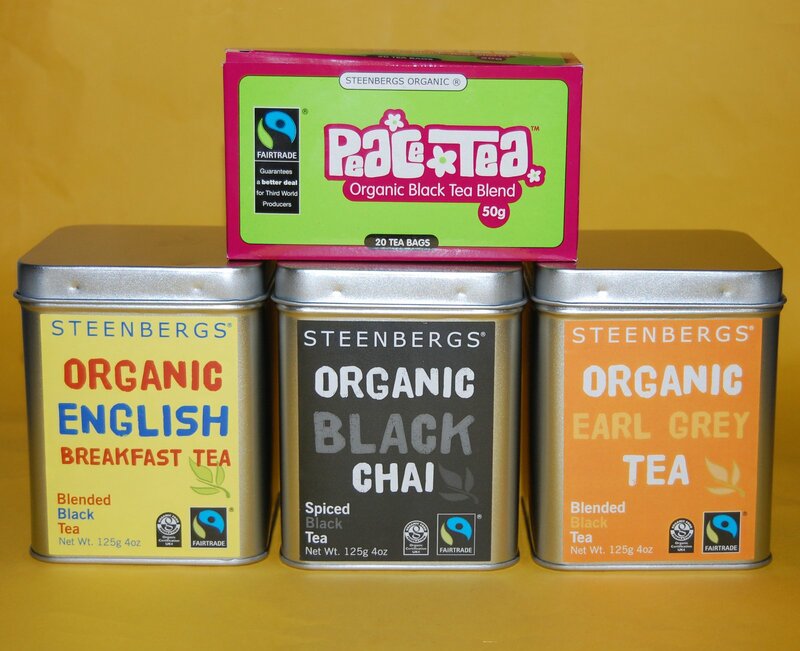 We've survived a flood, freezing weather (down to -18 degrees), worn out a fork lift, gone through 1000s of pallets, have more trolleys than we ever thought possible, have made a few tweaks of label styles, gone through 3 very different style of tea tins, and are onto our third version of hot chocolate tins. 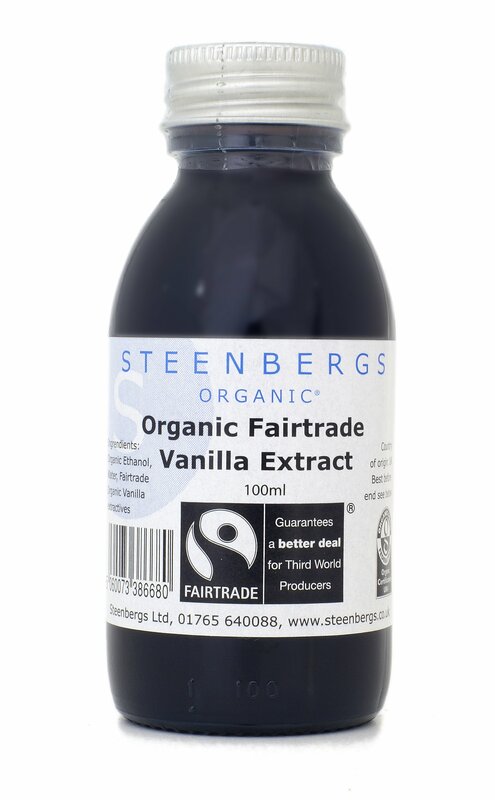 (We've also had to incorporate one major Fairtrade logo change and the new organic logo change.) 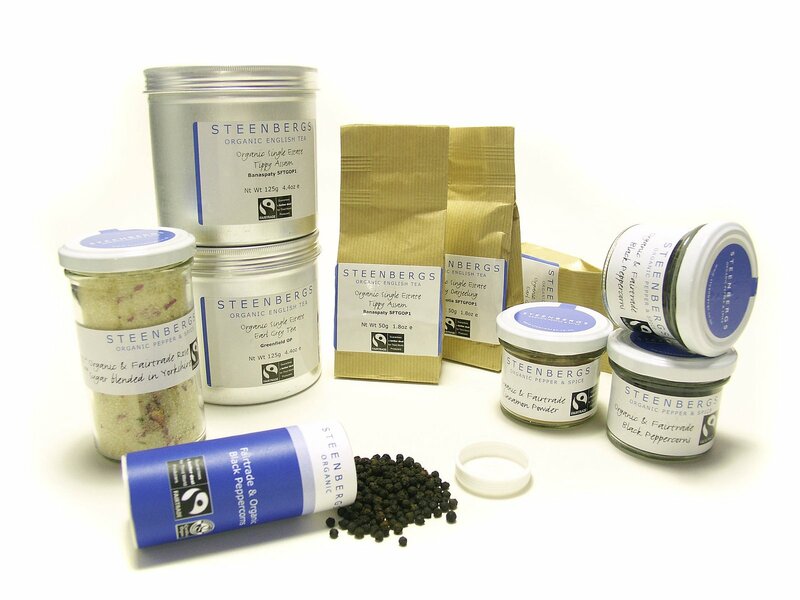 Meanwhile the glass jars we chose right at the beginning for our main range are still very much the core of Steenbergs. Oh and you still find Axel or Sophie filling jars, labelling jars, packing teas, making up gift boxes and boxing up orders quite a lot of the time. Two of our Steenbergs 11 staff have been with us for over 9 years, one of these - Claire - was our second ever employee and we are delighted that both she and Aga have stayed with us and seen Steenbergs through many changes. Many of our suppliers have remained the same from those early years. Our first ever organic import was from Lanka Organics/Greenfields and we still work with them importing many of our Fairtrade spices from them. We still buy our jars and lids from Croxsons and use the same designers for our leaflets - Colour It In. We like to work in partnership with our suppliers - growing with them and developing a close relationship with over the years. The original design of Steenbergs products was created by dear friend Alison Balmer and the core range has only undergone tweaks since then. Although our spice packaging has only had a few tweaks over the years, tea has been an area that has seen more design changes than anywhere else, the photo above has the first tin, then we moved to a square silver tin. 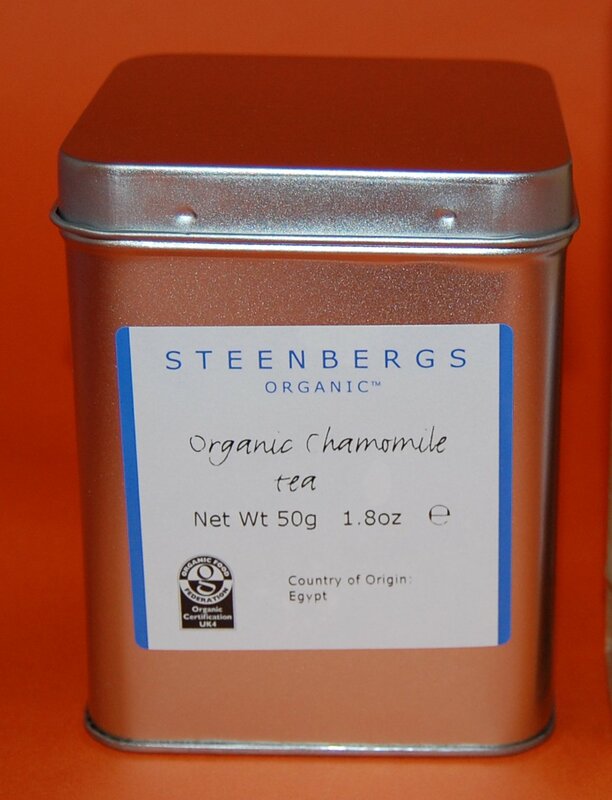 Organic chamomile loose leaf tea shows the second version of our tea tin. We've now introduced some machines to help us build the business. Originally everything was hand packed and hand labelled. Our first exciting machine was the labelling machine. 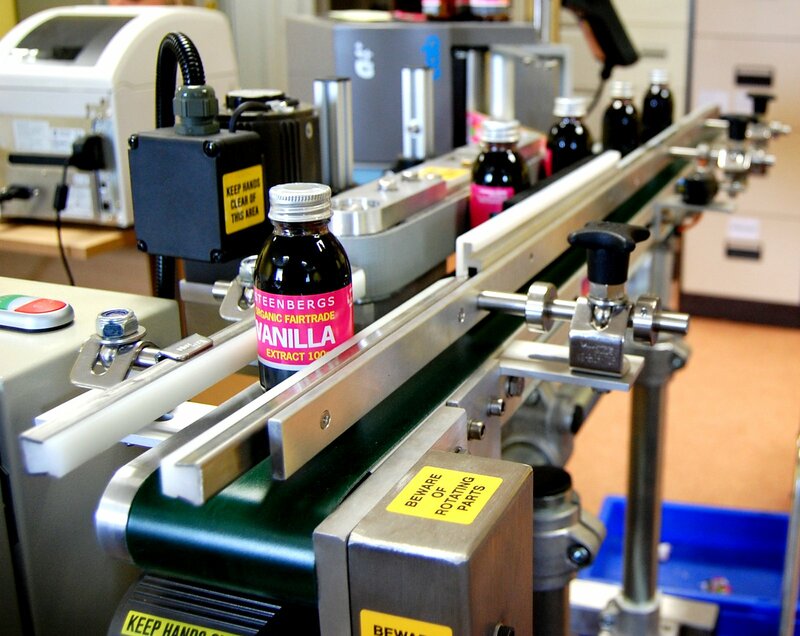 We still have a lot of hand finishing - the heat seal labels, the top labels, the translation labels. Our gift boxes arrive flat pack and are built up and created here so we still lovingly finish off all our products, but we do have some machines to help us along the way. Sophie and Axel are still very much involved, with Axel overseeing production and blending and Sophie more involved in marketing and orders. Although both of them will physically get stuck in and help where needed. As a small company we can't really cope with narrowly defined job roles, everyone lends a hand wherever and whenever needed - teamwork is crucial. Along the way we have worked with some lovely enthusiastic people and those who have been the most enthusiastic are still close to our business. 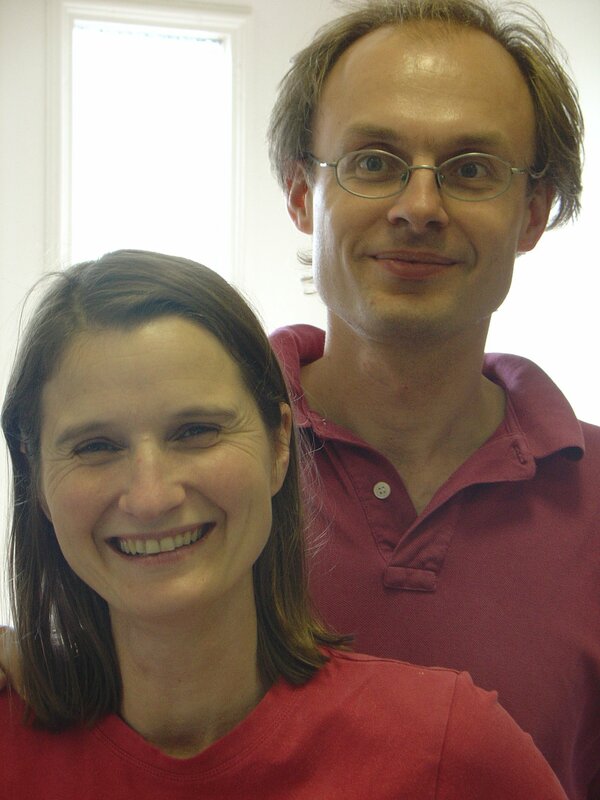 Sophie and Axel 10 years ago starting out with the business. Originally, everything at Steenbergs was packed by hand. We still do pack some things by hand, but we also can use a machine for quite a few of them, although some things like bay leaves and cinnamon quills will always remain by hand. (One of this merry crew is still with us although in a different role, in dispatch).